Do you have annoying mounds of dirt all over your yard? Are your plants disappearing and your trees dying of thirst because the roots have been chewed through? Then it sounds like you could have a gopher infestation. There’s no need to despair though, as Brezden Pest Control has state-of-the-art Gopher X Equipment to rid your property of gophers and other rodents. How does the Gopher X Equipment work? A trained pest control technician from Brezden will use the machine’s probe to find a gopher or rodent tunnel. Next, the machine will push heated smoke and carbon monoxide into the tunnels in a matter of minutes, swiftly exterminating the rodents. The smoke allows us to see whether the gas is escaping from the ground, ensuring the process is safe. 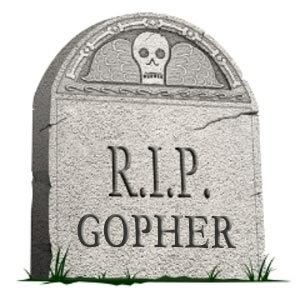 The Gopher X equipment doesn’t cause explosions or damage to your yard. The process won’t risk poisoning other animals and family pets. It’s quick, easy and reliable, unlike trapping methods. 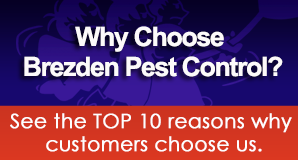 Inspect – Brezden’s pest control experts will examine your property, assessing damage and looking for signs to identify exactly which pest is present. Treat – we’ll safely and efficiently remove gophers and other rodents using our new Gopher X Extermination machines. Maintain – if areas around your property are infested with gophers, they will likely spread into your yard again. We can set up regular maintenance to keep gophers away for good. Are there gophers on your property? Gophers – are between 7 and 18 inches long with large cheek pockets (hence the name, pocket gophers). Each gopher can produce 10 – 30 crescent-shaped mounds of soil in a month in the course of digging holes and they’ll typically eat whatever vegetation they find along the way, especially grass, roots and bulbs. Gophers have strong, prominent yellow teeth which can also chew through wires and utility lines; each gopher’s burrow can cover up to 2,000 square feet. Moles – eat insects rather than plants and are smaller at just 6 – 8 inches in length and live almost entirely underground. If you do spot a mole you’ll notice it has very small ears and eyes and wide, spade-like feet with claws. Moles can dig at a rate of 12 – 15 feet per hour while they search for insects to fuel their high metabolisms, destroying plant roots in the process. Moles leave volcano-shaped piles of dirt rather than the ‘C’ shaped mounds left by gophers. Voles – are around 1 – 10 inches long and like gophers, they eat vegetation so are likely to destroy your plants, grass, flower roots, seeds and bulbs. They tunnel just beneath the surface of the ground so, unlike moles, you’re likely to catch a glimpse of these small greyish-brown rodents.